It’s Tuesday and I’m linking up with April at Run the Great Wide Somewhere, Erika at MCM Mama Runs, and Patty at No Guilt Life. The theme this week is “Alternative Medicine for Runners”, a really interesting topic! So be sure to head over there and check out everyone’s posts! I’m also linking up for Wild Workout Wednesday with Annmarie at The Fit Foodie Mama, Angelena Marie at Angelena Marie: Happy, Healthy & Balanced, Sarah at Creating Better Tomorrow, and Michelle at Fruition Fitness! They will be sharing a ton of great blog posts with fun new workouts to try – so definitely check it out! A couple of weeks ago I shared the benefits of running with a group and how to stick with it. Now I’m talking about how to stay motivated as a solo runner, because it is not always an easy task! You can talk to any runner, from newbie to professional, and they’ll tell you that it’s hard to stay motivated to run. Even when you have the best of intentions, it’s so easy to put off running for another day when you have other responsibilities, and it’s even easier when you have no one to run with you and keep you accountable. But it can be done! . If you want to push yourself to run consistently, why not check out a training plan? You don’t even need to be training for a race in order to use the plan – but it will help make running become more of a habit. 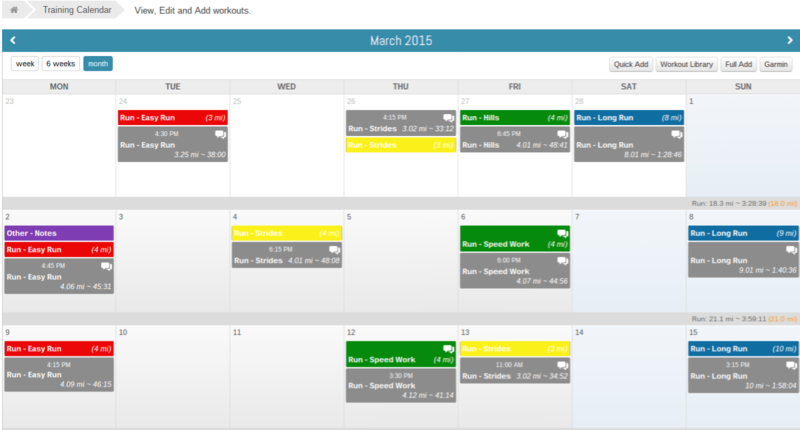 The training plan will tell you how many miles to run and on which days. Some plans tell you how fast to run, but if you’re a beginner, don’t worry so much about reaching those targets and focus on your mileage and effort. Training plans can range from 3 – 6 days a week of running/cross training. Be sure to use the plan that fits your ability. Of course, if you need to be flexible – feel free to change things around! But this will be a great way to get started if you feel overwhelmed by running. Personally, I know that all I need is a training plan to get me out the door. I feel guilty if I miss a run, and I actually prefer to do most my training runs alone because it feels like a personal goal that I’m tackling on my own. Maybe this approach could work for you. 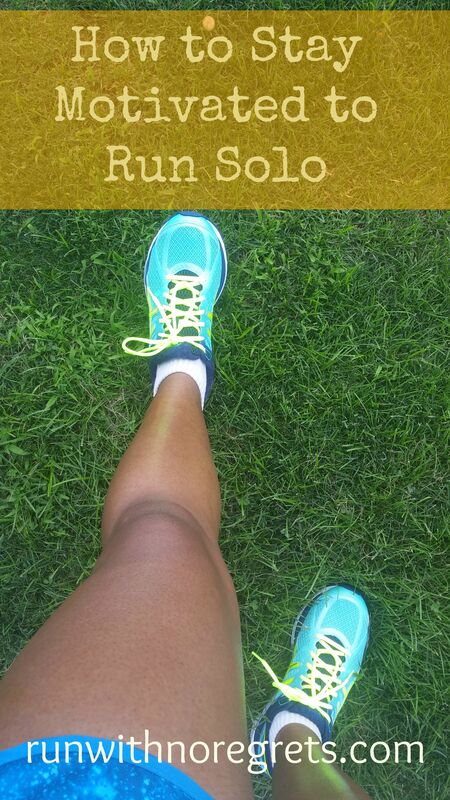 You can find training plans at this guest post I wrote on the ultimate guide to start running. Nike+ has some incredible training plans that you can check out as well. I have been working with a professional (aka paid) running coach since last summer, when I trained for the Rock and Roll Half Marathon, my first in over 2 years. I had come off some injuries and wanted to really take things seriously. Working with Kristy has been the best investment I’ve made in becoming a better runner. So if you want to run solo, why work with a running coach? They’re your own personal cheerleader! If you need a kick in the pants to really get your running on track, your coach will never let you down! They’re literally paid to keep you motivated! They can help you figure out your running problems. If I felt a strange pain during or after a run, I’d freak out and run to Google. Now I can talk to Kristy and we can adjust training as needed and determine whether it’s an isolated event or a chronic problem. You get a plan that’s just right for you. We’re all individuals and when it comes to running, no one size fits all. Working with a coach will teach you the nuances of your running style. If working with a human coach is out of your price range, there are also paid apps that have coaching mechanisms, like Runner’s World Smart Coach. You don’t get as much personalization but it’s a definitely a more affordable option. Are you a people watcher? Do you enjoy gorgeous landscapes or historic neighborhood streets? Find ways to keep yourself occupied/stimulated so that you’re not bored when running solo. As you know, I’m a huge fan of trail running. 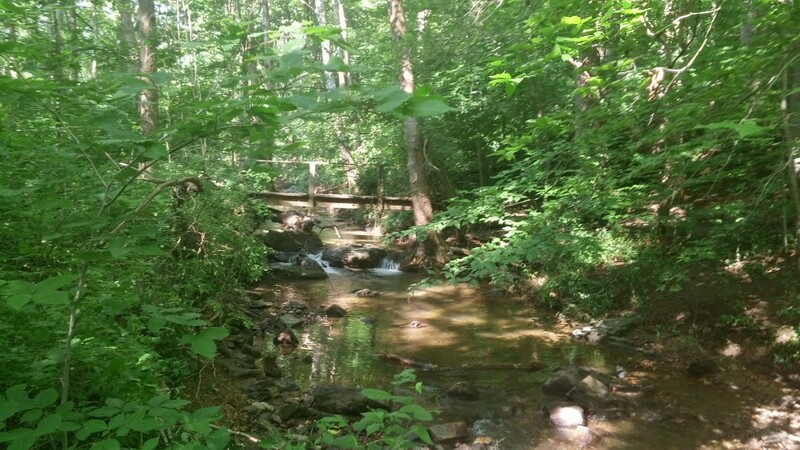 I love being in nature, smelling the fresh air, and feeling the soft earth beneath my feet. I don’t need to be with a soul when I’m running in this environment. For me, it’s as if no one else exists! Popping in some headphones can also help quiet those negative voices you may have while running and make it easier to focus on your surroundings. Find out what works for you and try to immerse yourself in that environment as often as possible! Then you have something to look forward to on each run! If you don’t have anyone to run with, maybe you can find a “virtual” running partner who will keep you motivated to get out there on your own! You can use Facebook or have a friend or loved one “on call” when you need them. The weather is so nice I’d rather do anything else! When you start sharing your runs on social media, you will start to pick up “fans” who look forward to your activities and wonder, “Hey, when’s your next run?”. running shoe, but I couldn’t figure out what I wanted for my second pair. A few weeks ago, I went back and was down to 2 pairs, deciding to go with the ASICS GEL-Cumulus 17. 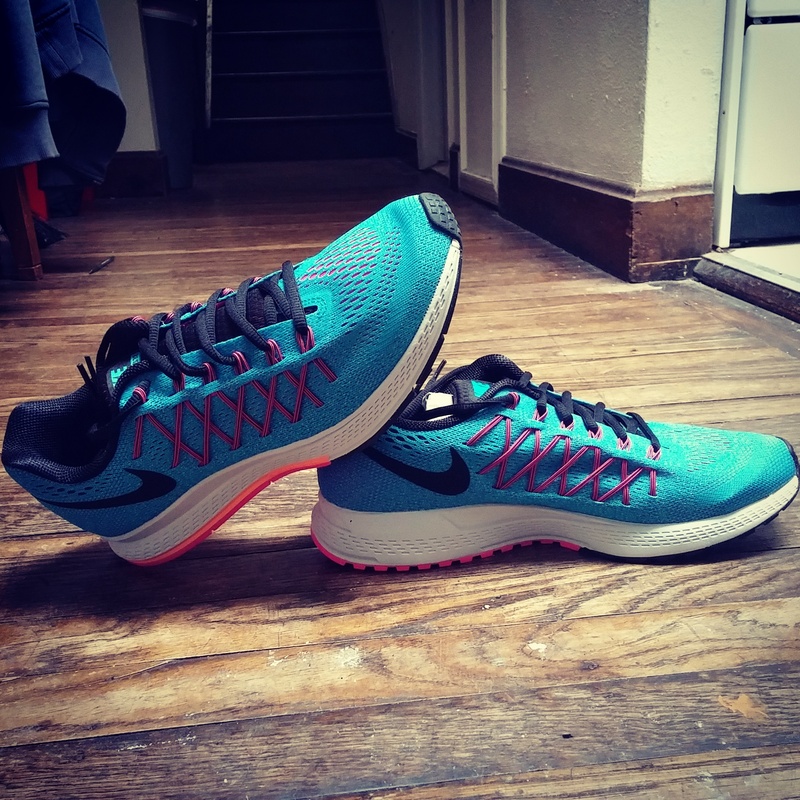 I talk more about my running shoe follies in my latest email newsletter. Long story short and one awful 11 mile run later, these aren’t the shoes for me. I’m taking them back to the store and trying something different. , and they are the perfect shoe for me right now! I’m in love! My new babies…Nike Pegasus…a keeper! Back to that 11.25-mile run…I decided to go for a long run in my new ASICS a few weeks ago and had one of the worst runs I’ve had in well over a year. My knees were killing me, and my feet felt terrible for days! I was getting flashbacks of plantar fasciitis. Not good! So I quickly made an appointment with my primary care physician. They took X-rays of both of my feet, and thankfully they were clean. But I am still taking care to stretch my calves regularly to ease my feet. My last runs over the weekend were pain-free, so I’m really grateful that I didn’t do any serious damage. Needless to say, I’m never buying a pair of ASICS again. I’m cursed! I’m very excited this week because I have finally started back up race training with Coach Kristy! I’ve been floundering without her guidance, so I’m glad to be back on track. This is actually the first official week, as last week was a “pre-training” week just to get used to running for 4 days a week again. Thank goodness! Now I can get my head in the game for my next race: The Philly 10K! Increased pace on my easy runs. I’ve been promoted from 11:30 pace to 11:00-11:15 pace! I’m still adjusting to this and have tended to run my easy runs way too fast – oops! More speedwork. Every week I will be doing speedwork. This week I’ll be doing intervals at 9:20 pace. The following week I’ll be doing fartleks for the first time. Fartleks are short bursts of speed. I’m excited! Cooler weather? Haha, this isn’t happening anytime soon…we seem to be stuck in the 90’s, geeze! I still need to figure out my racing schedule! I was really excited about the Sloppy Cuckoo on September 27 but the Pope’s visit ruined my plans. I may need to hop out-of-town that weekend to figure something out! Do you like running solo? What strategies do you use to stay focused and motivated? If you try any of the methods I suggest, let me know your thoughts! Let’s stay connected! Follow me on Facebook, Twitter, Instagram, Pinterest, and Bloglovin‘!